Back to School with a Smile! It’s that time of year again! School supplies are purchased (and labeled! ), new clothes are ready for those school pictures and the first day of school is upon us. We’ve put together a few tips on how to start the school year off with your best foot (and best smile) forward! Be sure to start the school year with a dental exam and cleaning. Some schools require that a child entering 4K or Kindergarten have a dental exam before the year starts. Even if that is not the case, be sure your child has their preventative visit before school starts or as soon as possible. If there are any issues, you want to catch them early and not have your child experiencing dental pain while trying to focus on their school work. Put up a brushing calendar for your kids! School is all about accountability and hitting goals. 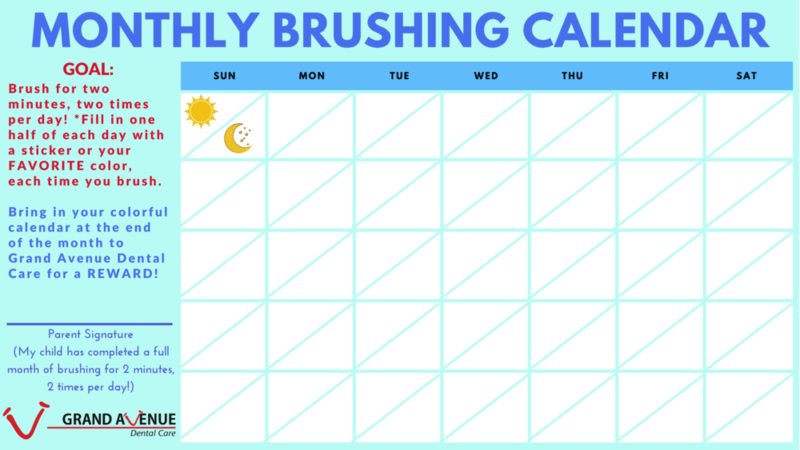 A brushing calendar to monitor their daily brushing habits will fit right in. Post this in the bathroom or their bedroom and encourage them to use crayons or stickers to mark down every time they brush. If they get a full month of brushing for 2 minutes, 2 times a day, consider adding a reward for them. See one below! Pack tooth-healthy lunches and snacks! It’s easy to pack processed foods in your child’s lunch because it’s quick, but remember that fresh fruits and vegetables are also quick and are a much better option for your child’s teeth and overall health. A few healthy options are: cheeses, cucumbers, apples and carrots. These will not only keep your child’s teeth healthy but also give them a great pick-me-up in the middle of the school day! With a few simple steps you can ensure that your child starts the school year with their best smile possible! Have a great school year, everyone!